V8 Supercars will conduct a tyre test of potential new 2017 Dunlop rubber immediately after the Winton SuperSprint in early May. The test is expected to include a new softer option than the current sprint tyre and an alternate construction of the harder control tyre. If the test is successful a second test will be conducted later in the year so an order can be placed by October to ensure introduction of the new tyres for next year. The tyres being tested at Winton are the products of a test conducted last year by then champion Jamie Whincup in his Triple Eight Race Engineering Red Bull Holden Commodore VF. 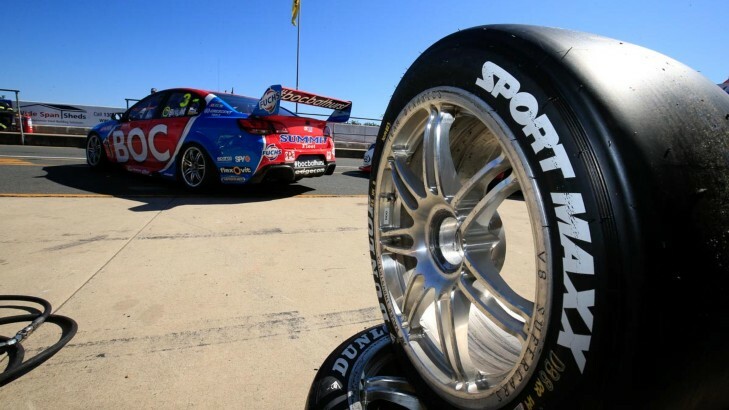 The forthcoming test was confirmed by V8 Supercars sporting and technical director David Stuart, who said the new soft tyre was a response to the increasing ability of teams to stretch long runs from the current Dunlop Sprint tyre. “What we want is a tyre that is going to offer us some good grip capabilities with wear that would ultimately on a soft tyre be less than a tank of fuel,” Stuart told v8supercars.com. That’s a significant move considering the increasing use of the soft tyre in the championship this year. Meanwhile, the hard tyre changes are intended to retain current durability while delivering more grip. The hard tyre continues to be used exclusively at high speed venues such as Bathurst, Phillip Island and Pukekohe, as well as sharing with softs at other venues. “We might change the construction of the hard tyre if we find there would be a benefit to the racing,” said Stuart. “Out of all this the racing is the key thing, the show. “We are not going to make any changes that are going to jeopardise the show, jeopardise the racing. We want to enhance the racing. Make that better. “The feedback from all the drivers is when they have grip they have the confidence to have a go. Stuart conceded Winton and its brand new surface may not be the optimum venue for a tyre test, but remained confident that valuable data would be gleaned from the exercise. “We will have the data from the race meeting and we will be on the next day,” he said. “We will baseline on the current tyre, but we will also have race meeting data from the current tyre. “As far as trying to structure a test and understanding what we have got that is the first step. As yet Stuart does not have full details of how many varieties of compound and construction will be tested, but he confirmed a wet tyre is not part of the consignment. The wet was again a subject of criticism from drivers after the Clipsal 500 where it struggled to cope in the terrible conditions. While its critics concede any wet tyre would have been overwhelmed in the worst of the conditions, they say a better wet would have enabled more racing and less laps trundling around behind the safety car. Stuart said he was not aware of any cost implications of moving to the new tyre. One of the great appeals of the current Dunlop tyre is its cheap cost. It understood V8 Supercars negotiations with Dunlop have focussed on keeping the tyre price affordable.